Gallia Academy freshman MaKenna Caldwell passes the ball from the back row, during the Blue Angels’ Sept. 4 victory over Ironton in Centenary, Ohio. The high school postseason is just around the corner, but the tournament roads were paved Sunday afternoon during the 2018 OHSAA Southeast District volleyball tournament selection process. Only two of the six local teams are scheduled to host a postseason match at the start, and a pair of the programs can also advance to the district tournament with a single victory. 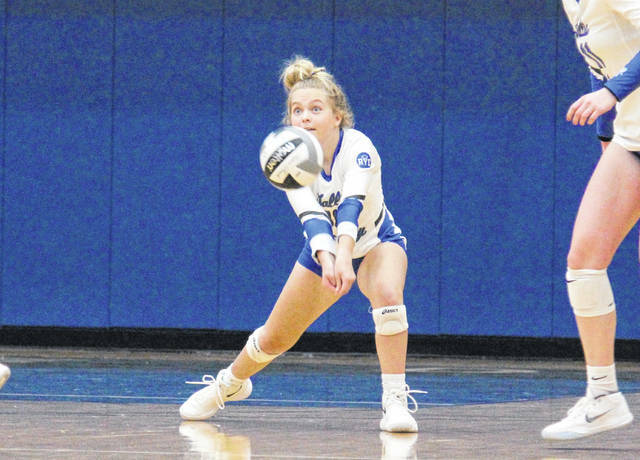 Starting in Division IV, Eastern (12-5) came away with the second seed in the East bracket and will host the winner of the Belpre at Ironton Saint Joseph match in a sectional final at 6 p.m. Thursday, Oct. 18. South Gallia (7-9) earned the six seed in the East bracket of Division IV and will travel to third seeded Trimble in a sectional final at 6 p.m. Thursday, Oct. 18. Southern (3-14) earned the nine seed and travels to eighth seeded Symmes Valley for a sectional semifinal contest at 6 p.m. Monday, Oct. 15. The winner travels to top-seeded Waterford for a 6 p.m. sectional final on Thursday, Oct. 18. The D-4 district tournament will be held Thursday, Oct. 25, and Saturday, Oct. 27, at Jackson High School in the Apple City. Gallia Academy (16-3) came away with the second overall seed in the Division II South bracket and will host a sectional semifinal contest at 6 p.m. Wednesday, Oct. 17, against seventh seeded Jackson. If the Blue Angels win, they will advance to the sectional finals and host the winner of the Athens at Waverly contest at 4 p.m. Saturday, Oct. 20. River Valley (8-10) earned an eight seed in the D-2 South bracket and travels to top-seeded Unioto for a sectional semifinal contest at 6 p.m. Wednesday, Oct. 17. The winner hosts the winner of the Vinton County at Warren contest in a sectional final at 4 p.m. Saturday, Oct. 20. The D-2 district tournament will be held Wednesday, Oct. 24, and Saturday, Oct. 27, at Southeastern High School in Londonderry. Meigs (4-13) came away with the 11 seed in the Division III East bracket and travels to sixth seeded Nelsonville-York in a sectional semifinal at 6 p.m. Tuesday, Oct. 16. The winner travels to the winner of the Oak Hill at Southeastern contest for a sectional final at 4 p.m. Saturday, Oct. 20. The D-3 district tournament will be held Wednesday, Oct. 24, and Saturday, Oct. 27, at Waverly High School in Waverly. Visit seodab.org for complete pairings of the 2018 OHSAA Southeast District volleyball tournaments.